This is a compilation post that brings together my views on closely related topics, collating articles that I published earlier on this blog. It doesn’t contain new content, although part of it may have been slightly reworked. Knowing that the whole is often greater than the sum of its parts, I hope this update provides you with a bigger picture, a more complete list of good practices, or a better grounded opinion. 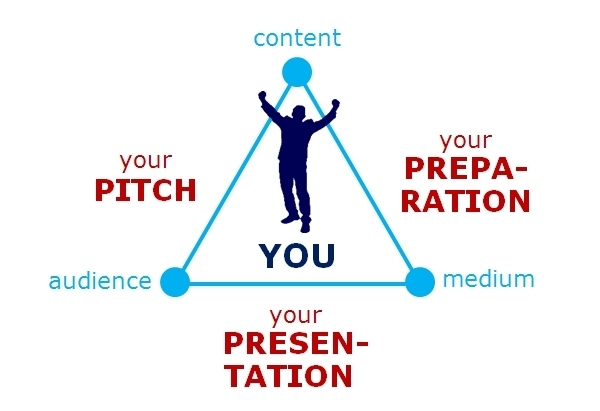 This is why I am dedicating this post to mastering the 3 P’s of presenting: Pitch, Preparation and Presentation. The setting is simple: when you want to deliver specific content to a specific audience via a specific medium, you will need to connect the corner points of the triangle in the picture above. First of all you will need to define your Pitch. The message(s) you want your audience to remember. How you will grab their attention and capture their interest. The story you want to tell them. This is where techniques like power mapping, message house building, and storyboarding will come in. Take ample time for your Preparation. Choose the most effective medium (e.g. a PowerPoint show, Prezi, naked speech, video testimonials, …) for getting your story across and adapt your content to it. This is where your right brain hemisphere comes to the fore. When creativity, design and empathy turn out to be your most valuable attributes. Do you remember the 7 C’s of a good story? Compelling, credible, concrete, clear, consistent, customized and conversational. If you remember these seven adjectives, you’re already one step closer to a great pitch. of the beholder. Adapt your pitch to address the WIIFM (What’s In It For Me) concern(s) of your audience. And give them something in return for listening to you. I am aware that many of you may suffer from glossophobia, or fear of public speaking. But honestly, if you have invested enough time in defining your pitch and preparing your presentation there’s really not that much left to worry about. The 3 P’s. Do you still know what they stand for? If you want to be a professional public presenter, then take control of your pitch, your preparation and your presentation. I have also created an infographic that summarizes this post. You may download the file by clicking on the image below (or hitting the download tab on top of this page). This entry was posted in Compilation post and tagged pitch, preparation, presentation, Public speaking by Marc Jadoul. Bookmark the permalink.